The reason for another of these posts is that I've been contacted by various people in different parts of the world (the USA, Australia, England) about flow mapping; how to do it, what to use it for and so on. Well, I think much more development is needed. I also need to keep blogging but I've been busy recently - poor excuse though. 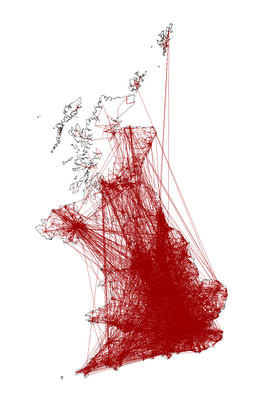 So, more results of my experiments in flow mapping... all of which use migration data from the 2001 UK Census. 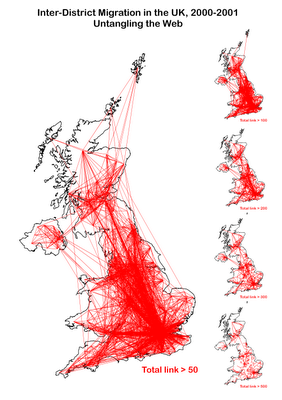 First we have flow lines for the United Kingdom, at district level and then along the side I show different link magnitudes. This map shows 'gross' flows. That is, the flow lines represent the total link between two places (so, if A to B = 100 and B to A = 50, the gross link = 150). On the second map, I've shown the same data but at ward level (n.b. there are about 430 districts and about 10,000 wards - as you'll understand, the migration matrices are pretty big). I've had to filter it to show only flows of 12 or more otherwise it's a jumbled mess. 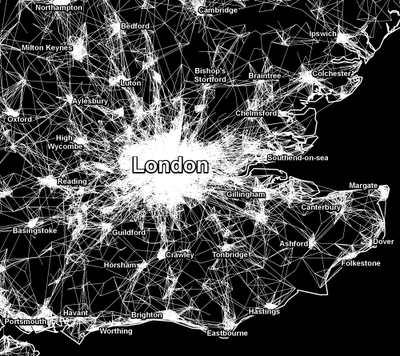 On the third map, I've shown this data just for South East England, in the area surrounding London. This illustrates, to varying degrees of success, the level of functional polycentricity which exists in relation to household mobility. Finally, I've attempted something different. I've produced a smooth surface raster, based on 2.5km cells, of all ward level migration. In some ways it is a success, but we can never really overcome all the limitations of 2D display. However, it does tell a story. Area Effects - do they exist?